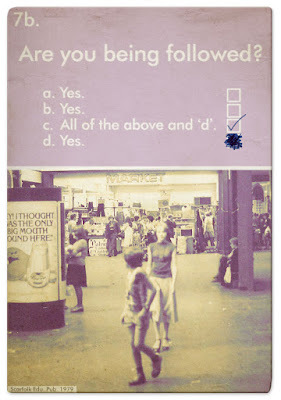 "Have you ever worried about how and when you might pass away? 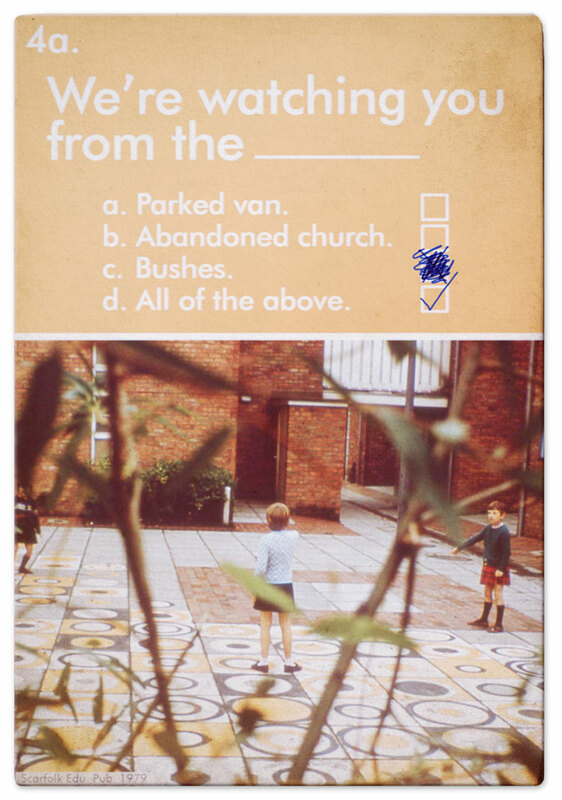 With an Expiration Card you needn't worry ever again..." (From a 1971 Scarfolk information booklet). 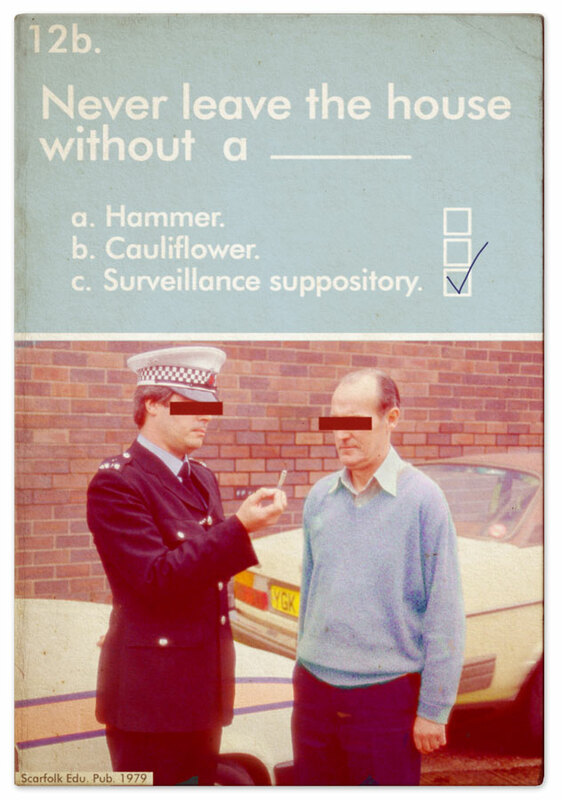 As of 1970 all residents of Scarfolk were issued with Expiration Cards. A dedicated council department, run by someone known only as Tod XIII, calculated when each citizen was most likely to become an 'unreasonable imposition' on society, then set an official date and method of demise. 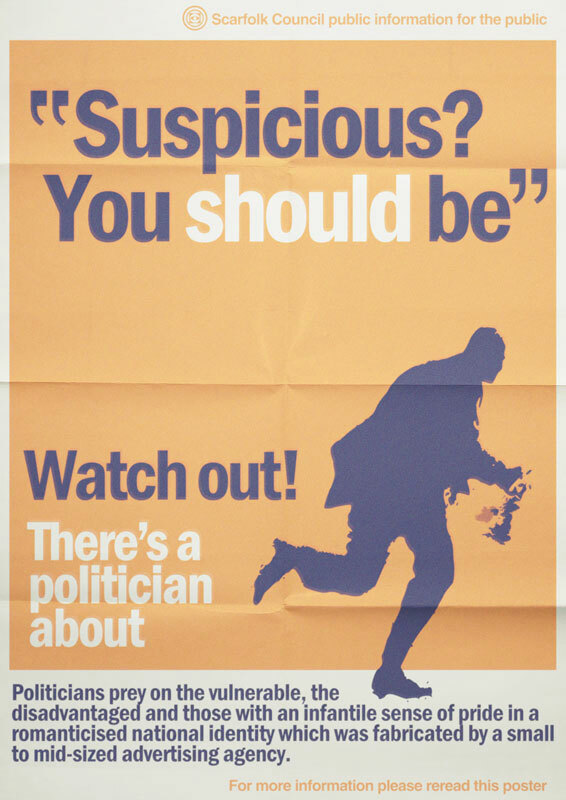 Sometimes, the date was brought forward if the citizen's circumstances changed: for example, if a person had become undeservedly depressed or poorly and was unlikely to ever again be gainfully employed by any self-respecting organisation. Each cardholder was expected to make the relevant preparations according to their allocated death event and to pay for it. Costs were taken directly out of citizens' income along with tax and costs incurred by governmental weekend breaks abroad. Unemployed cardholders had their assets and/or family members seized and auctioned off. 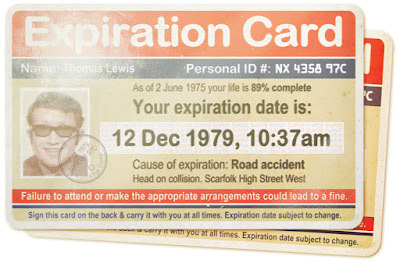 If a cardholder inconveniently died before their scheduled date and time, their card (and a hefty admin fee) was inherited by the next of kin who could either swap the card with their own - if the death event was preferred - or donate it to Scarfolk's Expiration Charity, which brought together poverty-stricken people to perish in the same event so that they may share costs. Charity expirations often took the form of driving a decommissioned double-decker bus off a pier into the sea while a brass band played. 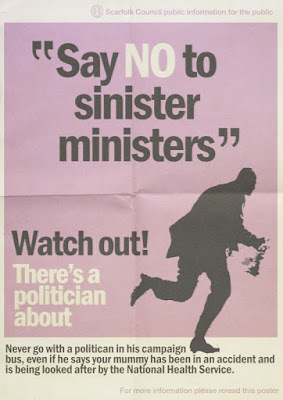 These expirations were televised on SBC TV's 'Beneviolence' programme, particularly if they featured once-popular celebrities who had fallen on hard times. 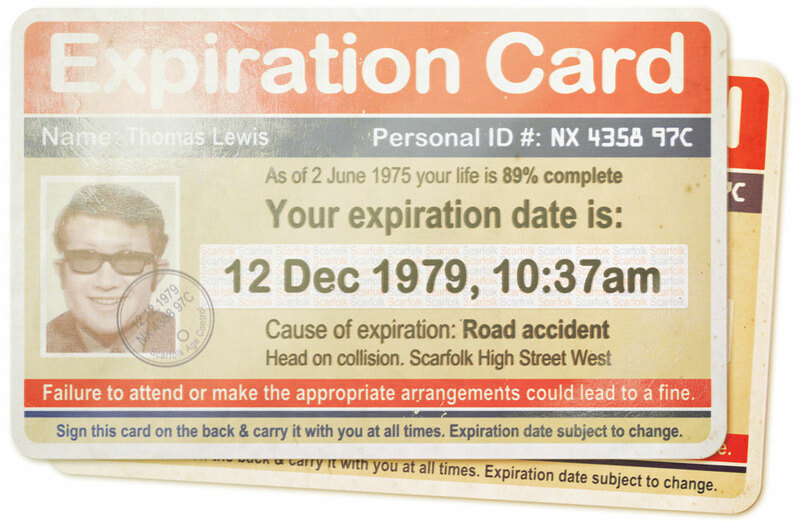 Note: Personalised Expiration Cards may be available for purchase in the future. 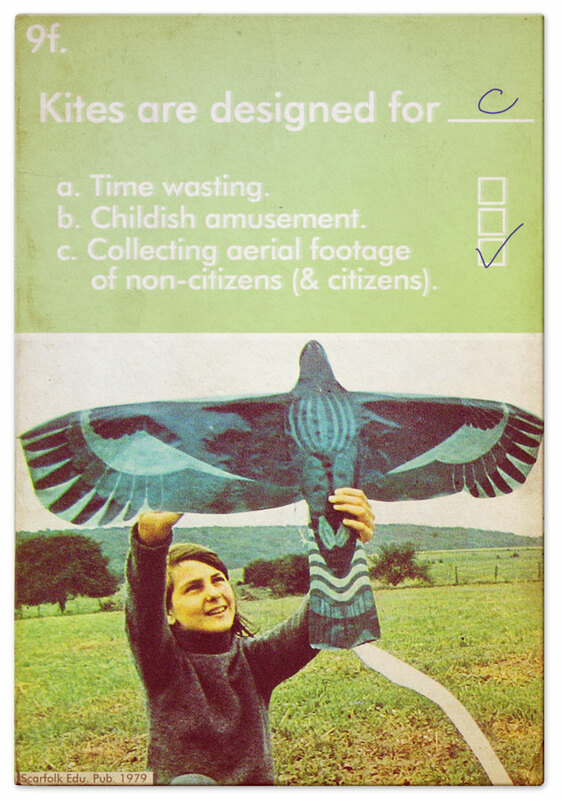 During the 1970s, the Scarfolk Education Publishing company produced packs of cards which taught children about society and its expectations. In particular, the cards focused on eradicating any false notions that children may have picked up from prohibited books, unauthorised wise people and illegal time immigrants (a flood of which materialised in 1979 to stockpile cake following a devastating pudding famine in the future). 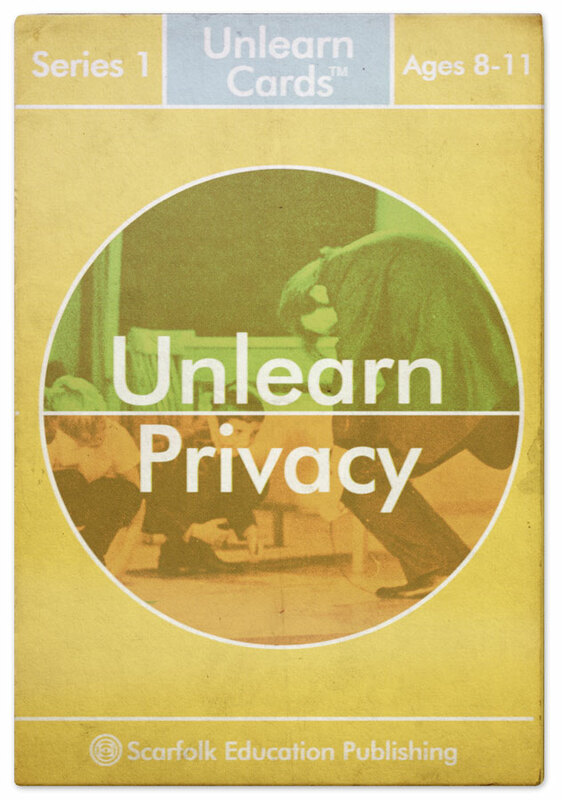 In addition to the 1979 'Unlearn Privacy' pack, examples from which can be seen below, other series included 'Unlearn Altrusim', 'Unlearn Democracy' and 'Unlearn Contentment'. 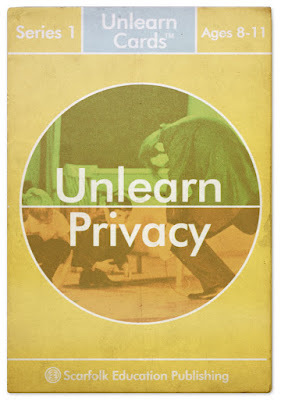 The aforementioned time immigrants claimed that, by the year 2017, surveillance and the invasion of privacy become so ubiquitous that citizens' brains are connected to a central network. 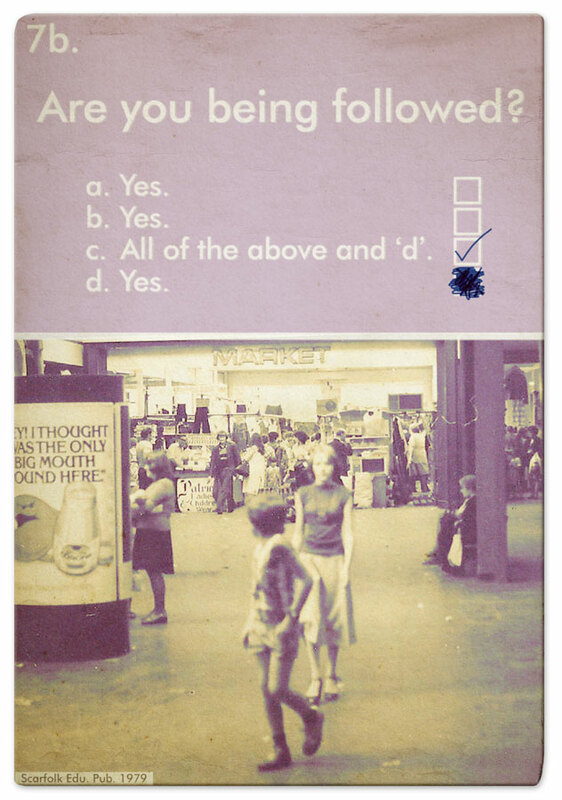 No thought, conscious or otherwise, is permitted expression unless it has been approved by a state computer programme nicknamed 'Brain O'Brien'. However, a backlog quickly accumulates, and many people go without a thought of their own for months, if not years at a time. Fortunately, the government predicted such an emergency and prepared in advance a series of standardised thoughts, ideas and opinions which it inputs directly into citizens' minds. No doubt it is this considerate civic gesture which leads to the overwhelming majority vote for the incumbent party in many subsequent elections. The bonus card above comes from an earlier pack, 'Unlearn Compassion', which was published in 1971. 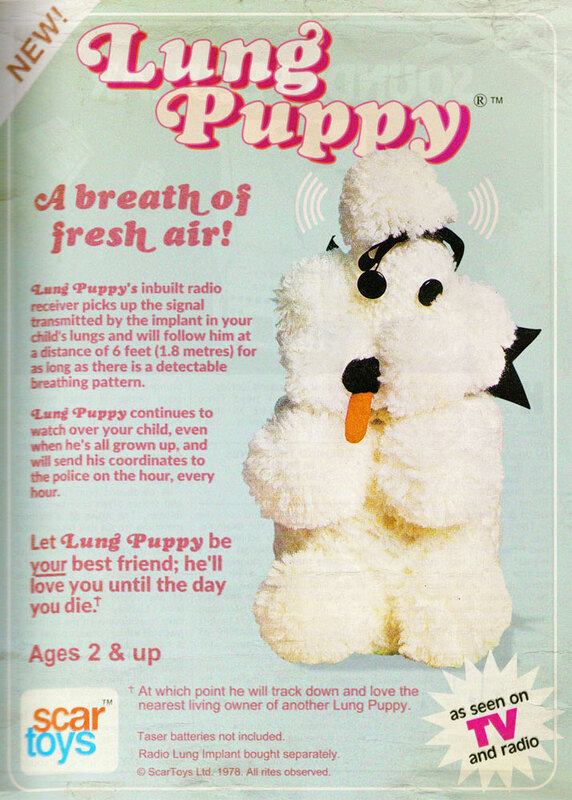 This magazine scan is of an advert for 'Lung Puppy', one of the many so-called "sentient toys" on the market in the 1970s. Not only did it follow your child anywhere (as long as your child was breathing), it also contained a device in the tongue that tested the child's galvanic skin response. If it detected inappropriate sweating, it assumed guilt and administered a Taser-like shock (see also: electrified Bibles, 'Discovering Scarfolk' p.149). 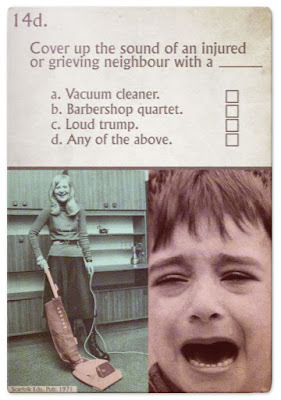 The toy was not recommended for asthmatics or those being regularly waterboarded. A more sophisticated version of the Lung Puppy - the Lung Alpaca - was used by the prison service to patrol cell blocks in Scarfolk Gaol. However, Lung Alpacas were withdrawn from service when 12 prisoners harvested the Alpaca's wool, knitted tunnelling equipment and escaped. By chance the gang was recaptured when a Lung Puppy which was previously owned by one of the criminals as a child detected his owner's breathing and lead police to the hideout. 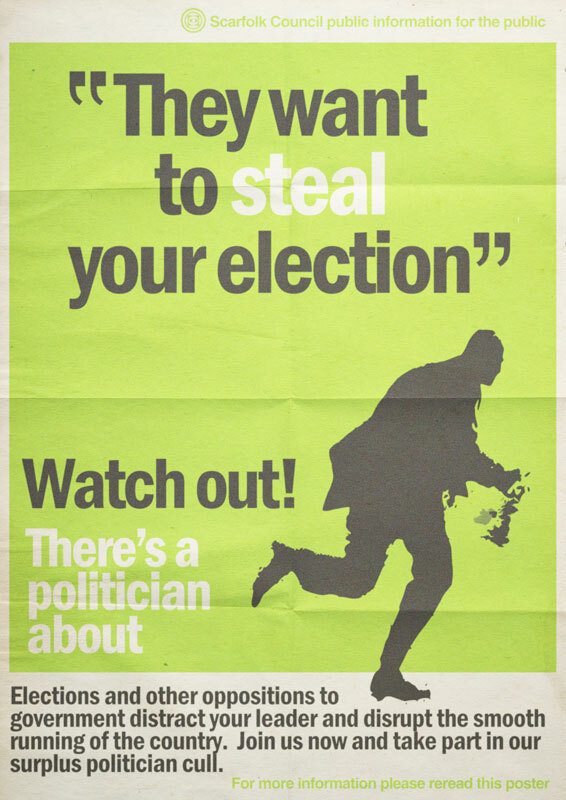 The general election will soon be upon us so we thought we'd upload a new poster every day during the week's run up. 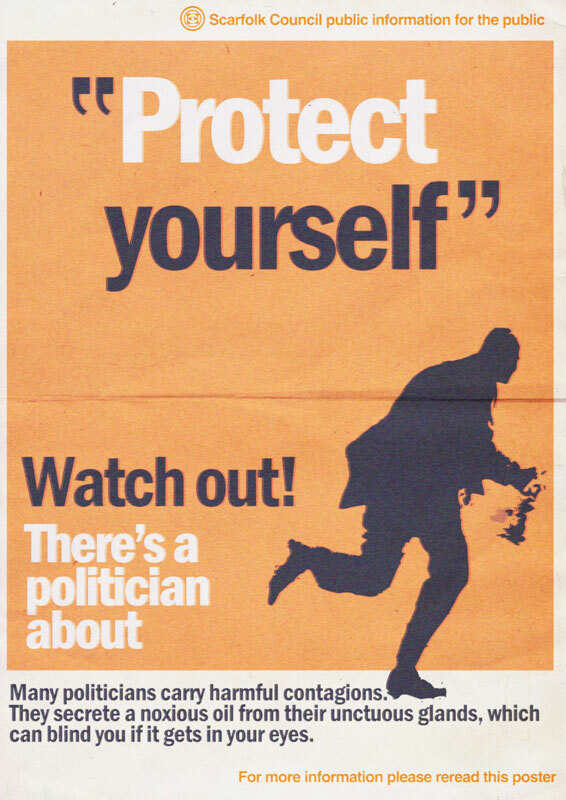 All the posters are from the 1970s 'Watch Out! 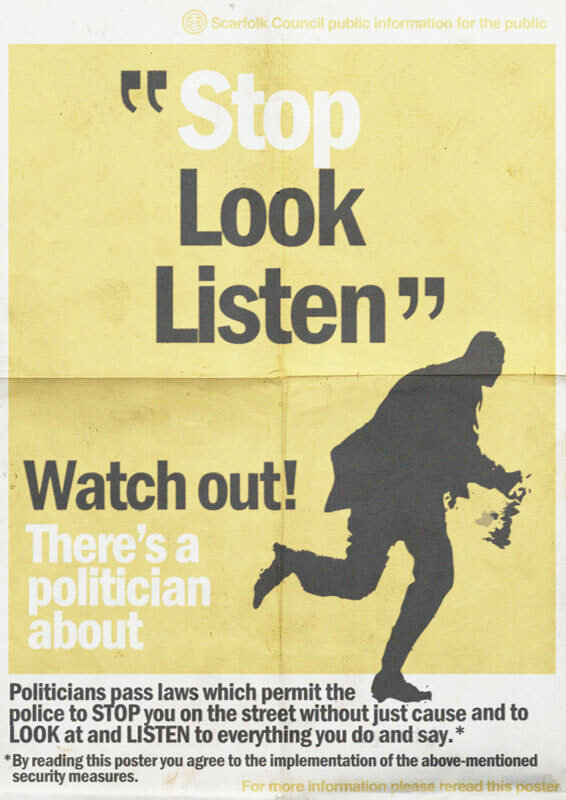 There's a Politician About' campaign. 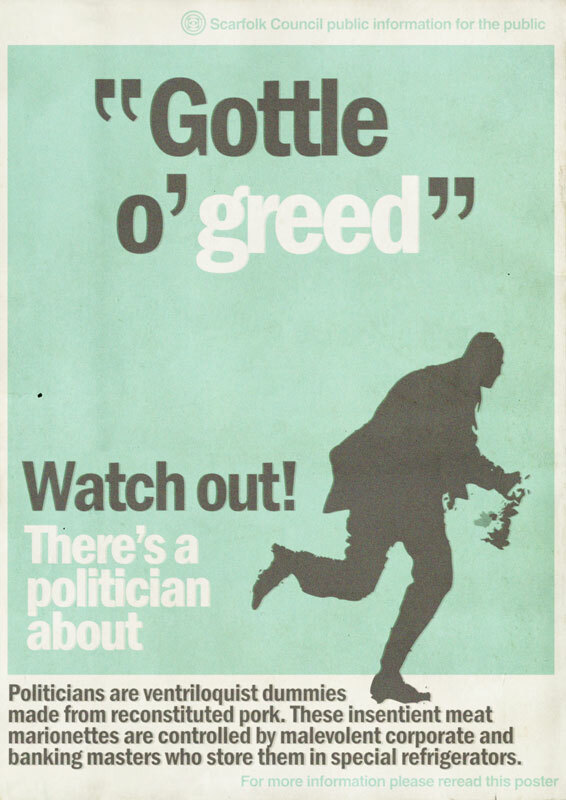 Just before the Scarfolk election of 1975 the ruling party was keen to permanently eradicate all political opposition and set out to smear what it called a 'hazardous surplus of politicians and others suffering from civic delusional disorders'. The incumbent's aim was to bring about a state of emergency that would permit a legal postponement of the election, a postponement that could, in theory, become indefinite. As the campaign gathered pace, there were even 'false flag' acts of terror. For example, when a bomb destroyed the headquarters of the National Health Service in May 1975, it was blamed on exploding lice carried by the children of liberal and intellectual parents, and in the same month a plot was uncovered to shackle the UK to mainland Europe with billions of tonnes of string below the waves of the English channel. 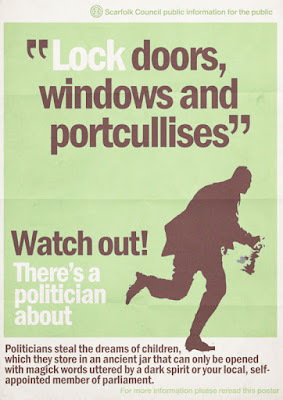 Use your vote wisely. Alternatively, vote for one of the parties currently on offer.